The Straad and St Ninian’s Bay are about 4 miles from Rothesay. From the pier walk (or drive) south on High Street to Russell Street, 3rd on the right past Rothesay Castle, turn right (south west) and follow Russell St, which becomes Barone Road (B878) out of Rothesay. After a 1 1/2 miles at Greenan Mill junction take the right fork in the road (straight on) onto A 844 and continue for about 1 mile then where the main road takes a sharp bend to the left take the unclasified road (straight on) to the Straad. 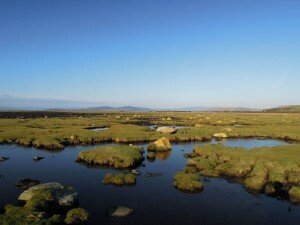 The main area of interst is the Bay itself and the saltmarsh to the north of the bay. 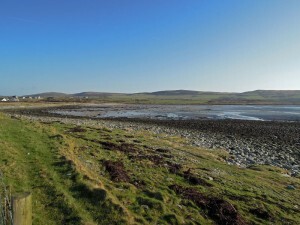 A rough track leads to a car park behind the bay but care should be taken on this track. Sandy Bay surrounded by farmland to the east and north with a saltmarsh to the northwest. The bay is good for waders including Ringed Plover, Dunlin, Oystercatcher, Curlew, Bar-tailed Godwit and occasional passing migrants such as Whimbrel. Golden Plover are seen most years in the fields to the north of the bay and the saltmarsh is the only site on the island where Grey Plover is found. Shelduck, Greylag and Canada Geese breed in the area and on both occasions that White-tailed Eagle has been found on the island they have frequented the Saltmarsh area. A look to the channel between the bay and the island of Inchmarnock during the winter months can produce Red-throated and Great Northern Divers , and Slavonian Grebe, along with the more common species that frequent the waters around Bute.The surrounding scrub is a good area to pick up summer migrants and the islands only record of Lapland Bunting was of three here in April 2011.